Keep your head cool and the sun out of your eyes with the dark red AALL baseball hat. Price includes shipping costs. Keep your head cool and the sun out of your eyes with the navy AALL baseball hat. Price includes shipping costs. Purchase the print edition of the AALL Body of Knowledge (BoK) brochure. Prices include shipping costs. 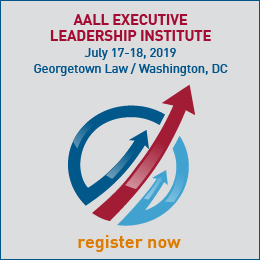 With your $75 upgrade, when joining or renewing, you support the profession and AALL and are recognized as an AALL champion. The AALL Lunch Bag is perfect for your daily lunches, tailgate camping trips, or other outdoor events. Price includes shipping costs. Wear the AALL Pin proudly. Price includes shipping costs. Purchase the print edition of the AALL Salary Survey. Price includes shipping costs. Purchase the print edition of AALL Spectrum, Volume 22 (6 issues in 2017). Price includes shipping costs. 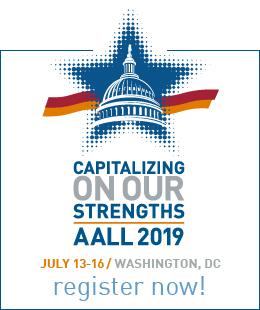 Purchase the print edition of AALL Spectrum, Volume 23 (6 issues in 2018-2019). Price includes shipping costs. The digital edition of the inaugural AALL State of the Profession report provides a wealth of insights and data on the law library landscape. Preview the report: The complimentary Snapshot is available. The print edition + digital edition of the inaugural AALL State of the Profession report provides a wealth of insights and data on the law library landscape. Prices include shipping costs for the print edition. Preview the report: The complimentary Snapshot is available. The print edition of the inaugural AALL State of the Profession report provides a wealth of insights and data on the law library landscape. Prices include shipping costs. Preview the report: The complimentary Snapshot is available. The AALL-Branded Nalgene® Water Bottle is the perfect companion for your daily walk, on your next hike, or just as an everyday vessel for staying hydrated. Price includes shipping costs. Join the Academic Law Libraries Special Interest Section (ALL-SIS). You will automatically be added to the ALL-SIS community after payment has been fully processed. You must be a current AALL member in order to join a SIS. Join the Computing Services Special Interest Section (CS-SIS). You will automatically be added to the CS-SIS community after payment has been fully processed. You must be a current AALL member in order to join a SIS. Join the Digitization & Educational Technology Special Interest Section (DET-SIS). You will automatically be added to the DET-SIS community after payment has been fully processed. You must be a current AALL member in order to join a SIS. Join the Foreign, Comparative, & International Law Special Interest Section (FCIL-SIS). You will automatically be added to the FCIL-SIS community after payment has been fully processed. You must be a current AALL member in order to join a SIS. Join the Government Documents Special Interest Section (GD-SIS). You will automatically be added to the GD-SIS community after payment has been fully processed. You must be a current AALL member in order to join a SIS. Join the Government Law Libraries SIS Special Interest Section (GLL-SIS). You will automatically be added to the GLL-SIS community after payment has been fully processed. You must be a current AALL member in order to join a SIS. Purchase the print edition of Law Library Journal, Volume 110 (Winter 2018 - Fall 2018). Price includes shipping costs. Purchase the print edition of Law Library Journal, Volume 111 (Winter 2019 - Fall 2019). Price includes shipping costs. Join the Legal History &Rare Books Special Interest Section (LHRB-SIS). You will automatically be added to the LHRB-SIS community after payment has been fully processed. You must be a current AALL member in order to join a SIS. Join the Legal Information Services to the Public Special Interest Section of AALL (LISP-SIS). You will automatically be added to the LISP-SIS community after payment has been fully processed. You must be a current AALL member in order to join a SIS. Join the Online Bibliographic Services Special Interest Section (OBS-SIS). You will automatically be added to the OBS-SIS community after payment has been fully processed. You must be a current AALL member in order to join a SIS. Join the Private Law Librarians & Information Professionals Special Interest Section (PLLIP-SIS). You will automatically be added to the PLLIP-SIS community after payment has been fully processed. You must be a current AALL member in order to join a SIS. Join the Professional Engagement, Growth, and Advancement Special Interest Section (PEGA-SIS). You will automatically be added to the PEGA-SIS community after payment has been fully processed. You must be a current AALL member in order to join a SIS. Join the Research Instruction & Patron Services Special Interest Section (RIPS-SIS). You will automatically be added to the RIPS-SIS community after payment has been fully processed. You must be a current AALL member in order to join a SIS. Join the Social Responsibilities Special Interest Section (SR-SIS). You will automatically be added to the SR-SIS community after payment has been fully processed. You must be a current AALL member in order to join a SIS. New! A one-time $425 renewal rate for retirees (does not include SIS memberships). Join the Technical Services Special Interest Section (TS- SIS). You will automatically be added to the TS-SIS community after payment has been fully processed. You must be a current AALL member in order to join a SIS.